When the box office champ Ben Stiller's comedic performances aren't a variation on a soft-spoken, put-upon everyman with an eventual fuse, he's usually playing a full-blown absurdist monster with an apoplectic Napoleon complex. These bizarre creations usually adorn films in which the funnyman provides the supporting work (DODGEBALL, HEAVYWEIGHTS), but, whenever he's directing, he's free to build an entire filmic universe around his asinine, ludicrously funny, culture-skewering characters and premises. 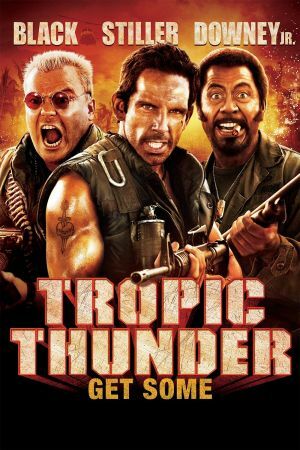 His ZOOLANDER (2001) bit at the entertainment industry with silly abandon, but Stiller has firmly set TROPIC THUNDER within the realm of sophisticated Hollywood satire. In it, a desperate director named Damien Cockburn (Steve Coogan) trying to make a Vietnam war movie drops his pampered actors into the heart of the jungle. Cockburn's stars include Stiller as an action hero who's starting to make bad career choices, Jack Black as an insecure low-brow comedy star going through heroin withdrawals, and Robert Downey Jr. as an Australian Oscar winner so lost in his "craft" he underwent a procedure to become black for his role. In the jungle, they remain under the delusion that they are still being filmed even after they encounter a dangerous gang of druglords. The film's basic premise has popped up several times since Hollywood's 1970s golden age in films such as THREE AMIGOS! and GALAXY QUEST. 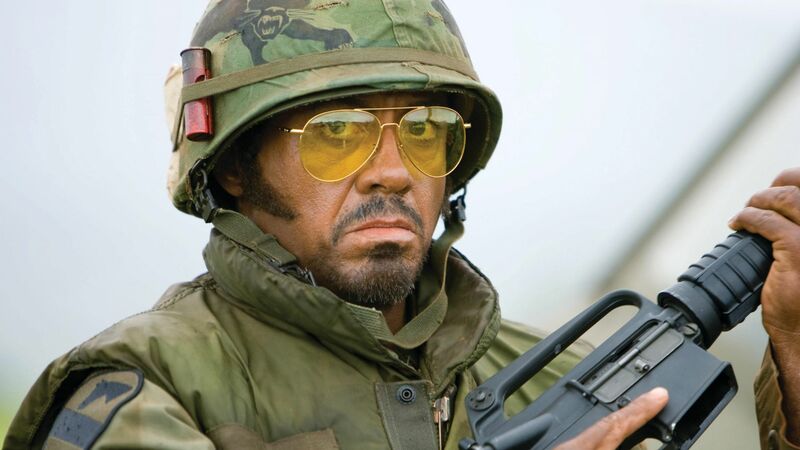 Where those films simply blanketed a classic Overconfident Bumbling Idiot comedy showcase with a pop culture lexicon, however, TROPIC THUNDER could have only been made, as on-the-nose at is, by people who have been working in the Hollywood system for years, making cutting observations along the way. Simply put, this raucous satire knows big-budget filmmaking, the delusional narcissism of actors, and even the good points of those actors--perhaps why they're celebrated--like the back of its hand.